Louis Fors Hill is the great-grandson of railroad magnate and entrepreneur James J. Hill. A 1971 graduate of the University of Minnesota with a degree in mathematics and geology, he currently serves as chairman of Rockwood Capital Management, Inc., an entity formed to manage financial and family heritage assets. 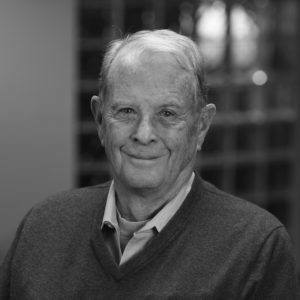 In addition to his management role with several family-owned businesses, Mr. Hill has served on numerous philanthropic boards representing diverse charitable objectives. His trusteeship includes service with the Hazelden Foundation, Hamline University, Glacier National Park Fund, American Composers Forum, Shattuck/St. Mary’s School, the United Hospital Foundation, Northwest Area Foundation, the Science Museum, Hill Hydrocarbons, Inc., Hill Museum & Manuscript Library, Little Tree Partners LP, MN Council for Quality, MN Mineral Resource Education Foundation, Pacific Rim Equipment Corp., Powell Canyon Production Co., and several other organizations. Louis has been awarded two patents: U.S. Patent #4,103,955 in 1978 for a log cinch and U.S. Patent #4,362,195 in 1982 for a portable log debarking apparatus. Louis was born and currently resides in St. Paul, Minnesota. He is married to Kathrine E. Hill and has seven children, two stepchildren, and ten grandchildren.